So I spent the weekend creating a board game. It's a racing game using dice, playing cards and hopefully a few curse words. 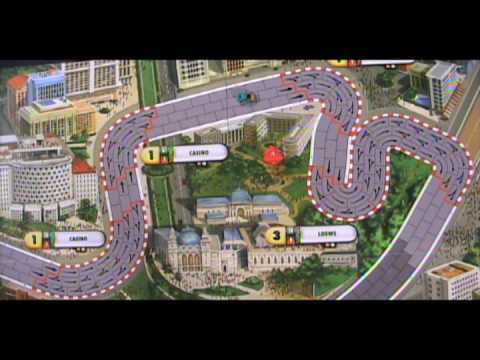 The basic idea is trying to speed around a race track while messing with the other players on the track. If you find some kind of bug or loophole in the game please let me know. I decided not to upload a track because it's basically easier to quickly draw a track on some paper. A track of about 60 spaces feels like a good game length when you run 2 laps. And I put in a pit stop at about each 20 spaces. I only did 3 playtests but those guidelines for the track seemed good. But you can do what ever you want. Make a 10 space track and run 100 laps or even create a straight track that doesn't loop. So give it a play and let me know what you think. :) For the guys going to the Jozi meet during the week...I will bring a prototype with me so that whoever wants to give it a go can play it. Oooh a board game, sounds pretty cool. 1) I realize that making your own track isn't particularly difficult, but I think it'd be a good idea to include at least 1 example track to get people started. 2) Regarding upgrades, am I correct in saying that when getting to a pit stop (which as I understand it, would ideally be on the last block of your movement), if you elect to get upgrades, you draw 2 upgrade cars and you MUST select 1 of them to use? IE The player cannot draw 2 cars and decide that neither will improve his play and discard both of them, so it's a gamble. 3) Also, the +2 modifier for having upgrades only applies if you have all 3 upgrades right? IE You don't get up to +6, you either get +2 if you have 3 upgrades, or nothing. 4) The supercharger says you get a movement bonus if you roll and "unmodified double", does that mean if you roll for instance 2x4 and you have no other movement modifiers? I don't think that is particularly clear...though to me the other things I can think it could mean seem less logical. 5) What happens when somebody stops on top of an oil slick? I presume that that doesn't count as driving "over" it, and the oil slick would then take effect on their next turn, where they would move exactly 1 space forward regardless of whatever movement value they get. 6) Nitro says that the Nitro dice are not Movement dice. The only significance I can see in this is when you get penalties that reduce the number of dice you roll. So correct me if I'm wrong here but I imagine that if say 2 other players rammed you between 2 of your own turns, and they both roll a 6, then they would both cause you to roll 1 less movement die but you cannot be made to roll less than 1 movement die and nitro die are not movement die, so if you used nitro you would still roll 2 dice (despite being mega-rammed twice). Is that correct? Also, I assume that rolls from Extra Nitro Canisters do not count as movement either? There is also a bunch of spelling errors in both the rules and the cards =/ Can't wait to actually play it though! Just printed the cards and rules. Will play it tonight and come back to you! 2) Yes, you are correct. You may however choose not to stop at the pit stop at all and avoid the whole situation. 3)Yes, also correct. It's a flat bonus you get for owning all three upgrades. 4)Basically what it means is that you have to look at the dice faces. Let's say that you own a upgrade that adds +1 to your movement and you roll a 3 and a 4. you wold move 8, but you are not allowd to "make" the 3 a 4 and claim the supercharger bonus. 5)When a player stops on an oil slick it works exactly the same way. But in this instance it would(probably) benefit the player. the car would move one space forward as the driver loses control and skids forward. They will take their next as normal. 6) That is corret. Also note that things like the supercharger state you must roll it on your movement dice. You are not allowed to take the nitro dice into consideration when checking for the supercharger bonus. And yes, the extra nitro canisters provide you with extra nitro dice. The dice movement make the game very reliant on luck as supposed to skill, and the +2 and +4 modifiers aren't significant enough to adjust it. I would recommend doing it the other way around. Have a fixed movement (I suggest 4 spaces) and use 1 dice roll as a modifier on certain upgrades. This'll will give the game more focus on using the upgrades and equipment and just hoping for a good roll. The placement and pausing for the pitstop also feels at odds with the flavour of the game. Because the theme is more Carmageddon than Formula One I suggest that players can either play an equipment card in their turn or draw an upgrade. I love that the upgrades are almost equal and depending on your circumstances you might favour one upgrade over another. I think you should work on these some more to make them all equally powerful under different tactical situations for players to choose between. I couldn't download the racetracks so I just made a circular map. I think you should supply the tracks and it would be great to see the tracks actually mean something than just place markers i.e. have some squares on the map have a permanent effect. Alternatively work the game so that there's no physical map and it's a pure card game with maybe some "position" tokens to denote who's in poll position. 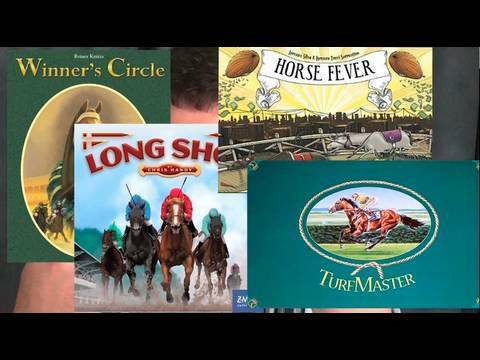 Can I recommend checking out the Board Games with Scott episode on Horse Racing to get some ideas. I especially love in this episode that he talks about the difference between strategy before the race starts and then the tactics during the race. @aodendaal, thanks for playing. :) The game is very much luck based at the moment. So far the playtests I have done this hasen't been a real problem. Not because it might not be a problem, but the people I played with probably don't care too much about strategy :P. The idea you gave about the flat movement rate seems really good. I'll have to give it some thought though, at the moment I like the idea, but would feel bad about losing some of the chaotic aspects a dice based movement brings to the game. I agree about the pitstops. I spaced them evenly to make sure that everyone has sort of the same chances of getting 3 upgrades, but sometimes you are 2 squares away from the pitstop and you roll a 12 or something. The solution you suggested seemed good though. I'll try that in the next iteration. If the prototype seems fun enough I plan on really working on the upgrades and equipment. They are a big focus of the game but I haven't really spent nearly enough time on making them balanced and useful. I watched the video(thanks for the link). I think what I am trying to create with this game is a tactical focussed game with elements of in game strategy. But on order to create the in game strategy part I would need some way to leverage the upgrades against long term goals. Just for interest sake, how many people did you play with, and what where some comments made(not about the game, just funny stuff that resulted from playing :P)? I don't have internet at home so I couldn't download them after I left work. I played by myself with 4 cars to test. If you want to keep the dice (and I think it's awesome if you want the chaos) then instead of giving the static +2 and +4 bonuses make one grant a re-roll and the other roll a third die and take the two higher. Continue with your upgrades that grant or deny extra dice and re-rolls. Ramming can deny a die or 2 in the opponents next roll and oil slicks will become super mean because no matter how many dice you roll it stops you in your tracks. Then the mechanic of "how many dice you get to roll and/or re-roll" will be the focus of the game.